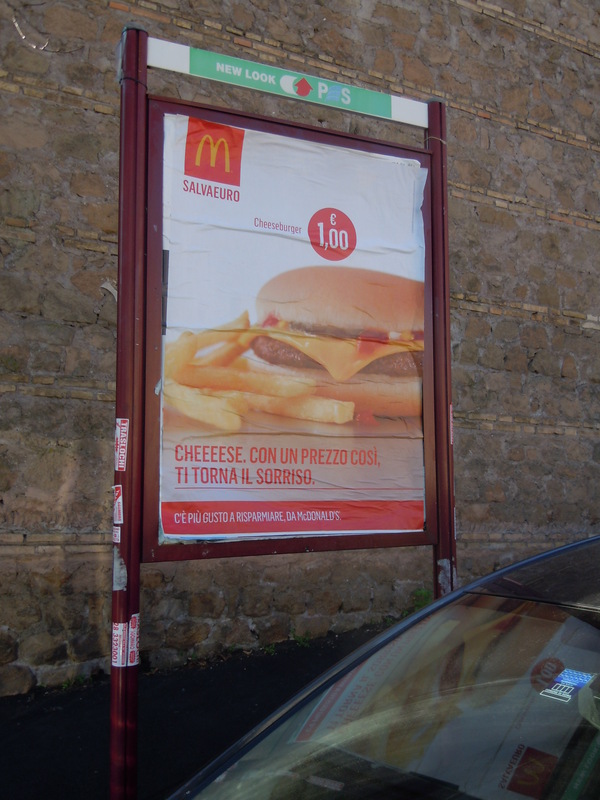 McDonald’s has a prominent ad campaign in Rome right now advertising a burger special. You can have a cheeseburger and french fries for just 1 euro. Maybe they’re just trying to do something for Italians who are suffering through the great economic crisis. Feed everyone in the family for only 1 euro each. That is so disrespectful in so many ways. It’s disrespectful to the great tradition of la cucina povera. The healthy vegetable and legume rich soups and stews that were created by people with little money but fantastic agricultural resources, and it’s disrespectful to those same resourceful people who created the torta rustica, which are savoury pies filled with vegetables and maybe a tiny bit of pancetta for flavour. Like an invasive species (the serrated tussock plant of South America comes to mind, for some reason – it spread to other countries competing with local plant species and reduced biodiversity), fast food hamburgers have spread from America and have been changing eating habits and damaging culinary diversity. Mostly, charging 1 euro for a cheeseburger with fries really disrespects the cow. I’d like to say the cow that gave its life for the burger, but there are likely bits of numerous cows in one of those hamburgers. The influx of fast food hamburgers has put great pressure on the industry to provide enough ground beef to meet the demand. Eighty percent of all ground beef in Italy comes from the same slaughterhouse that provides it to McDonalds and other fast food restaurants. The country can’t meet the demand without lowering its standards. Already, agriculture ministry vets are finding growth hormone in cattle in random tests – even though it’s banned in the EU. To sell a cheeseburger with fries for 1 euro cannot be done without further degrading the food system in Italy. At the very least, they should raise the price to reflect what it really costs to raise healthy cattle. I’m thinking of starting a new movement – Respect the cow!